On February 8, 2012, Chhatra League activists, in a pre-planned manner, started a quarrel with a Shibir activist in the 2nd year class of Islamic history over seating arrangements and attacked two Shibir activists seriously in the presence of the Assistant Proctor. Chhatra Shibir organized a protest procession in protest of the incident, which was attacked by police from behind, and Chhatra League’s armed attack from the front. In the presence of Proctor, Chhatra League shot at Masud Bin Habib, Secretary of Suhrawardy Hall. To ensure his death, the criminals continued to hack him with with sharp weapons such as Ramada and Kirich. 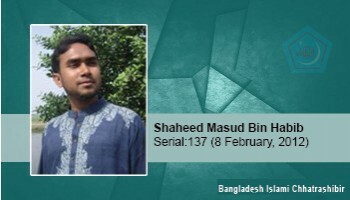 Later, on his way to hospital, Shaheed Masud bin Habib attained martyrdom.